Cook was captain when England was swept 0-5 on its last Ashes tour Down Under amid the intimidating pace of the now-retired Mitchell Johnson. 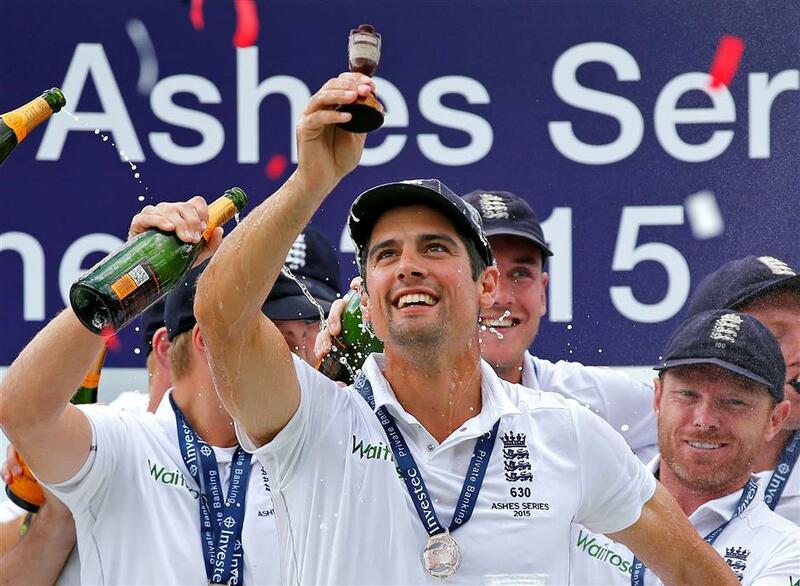 England captain Alastair Cook and teammates celebrate winning the Ashes with the urn on the last day of the fifth test against Australia at The Oval in London in this August 23, 2015, photo. Alastair Cook is the most experienced cricketer contesting this Ashes series, so he can take comfort from the longer view when considering England's chances in Australia. He's seen all the hype about banter and aggression before, having played 30 of his 147 tests in the Ashes environment. Cook was captain when England was swept 0-5 on its last Ashes tour Down Under amid the intimidating pace of the now-retired Mitchell Johnson, and the Australians are focusing on the legacy they believe that leaves for the tourists. But Cook, now "back in the ranks" after standing down as captain, doesn't think memories from that series, or the fact England hasn't won a test at the Gabba since 1986, will count for much after the first session of the series in Brisbane. "England have won four of the last five Ashes series," he said, "so you can look at (whatever statistics) you want." The England batting crumbled as Johnson took 37 wickets in five tests, backed up by pacemen Ryan Harris and Peter Siddle. Even Cook struggled, averaging only 24.6 and with a high score of 72. His overall average in Ashes tests in Australia is 49.53, and he scored four centuries across his previous two tours — including his 235 in the drawn test at Brisbane in 2010. Joe Root, who became England captain last July and has won five of his seven tests so far, didn't see out the series in 2013-14, missing the last test after averaging just 27.42. None of that concerns Cook, who points out that there are only a few players still active on either team from that series in 2013-14. "Mitch (Johnson) bowled outstandingly in that series, one of the best periods of bowling I've ever faced, backed up by Ryan Harris, Peter Siddle — (but) they're no longer playing," Cook said. "So in one sense it's a bit irrelevant. It happened four years ago." Australia is taking a similar tactical approach, relying on a pace trio comprising Mitchell Starc, Josh Hazlewood and Pat Cummins supported by offspinner Nathan Lyon. Cook noted it's a quality attack, but not an extraordinary one. "They're not suddenly bowling 150 miles per hour," he said. "They've "got (no) magic balls which start way outside the stumps and swing miles. They're very good bowlers with good records. As batters, that is the challenge we've got in the next seven weeks." Much of the attention on England's lineup has been on the inexperience in the batting department and the absence of allrounder Ben Stokes, who may not take part later in the series depending on the outcome of a police investigation into a nightclub incident he was involved in on September 26 in Bristol, England. Cook said England has "pretty much accepted" that Stokes won't play a part in the Ashes, countering media speculation that he will still be part of the England side for the later tests. Cook was encouraged by his 70 in a tour match in Townsville last week, and said he'd been improving in each innings in Australia with his timing and rhythm. Moeen Ali, who has recovered from injury and is likely to bat at No. 6 or 7, was similarly upbeat about England's prospects this series and wasn't interested in speculating on the return of Stokes or the banter coming from the Australian team. "There's genuine confidence we can win here," Ali said. "It'll be great to come away with a win and get a good start to the series." Cook also is advising any teammates who haven't played an Ashes test in Australia not to take any notice of the pre-series hype or the boisterous crowds. "All the talking stops very quickly and the series becomes a normal series after the first two hours," he said.